There are 33 data files with this data set in GeoTIFF (.tif) format for the period 2001 to 2015. This includes 30 yearly files of snowmelt timing and cloud interference data (15 files each), two files of means for all years combined, and one file with the count of snowmelt timing values (the number of years on record in the STMs from 2001-2015). Figure 1. 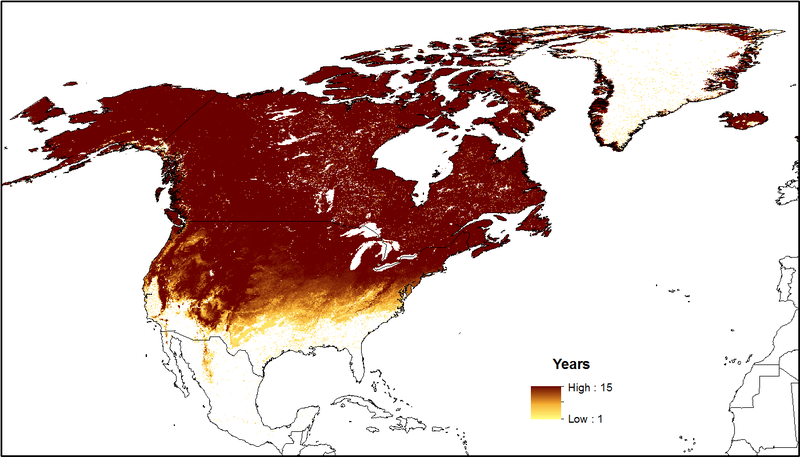 Mean snowmelt Day of Year (DOY) for the years 2001-2015 for North America. The DOY values for snowmelt timing were identified by observing the transition from snow-cover to no-snow for individual MODIS pixels, throughout the annual melt period (the projection of this image may not be in the same projection native to the data set). 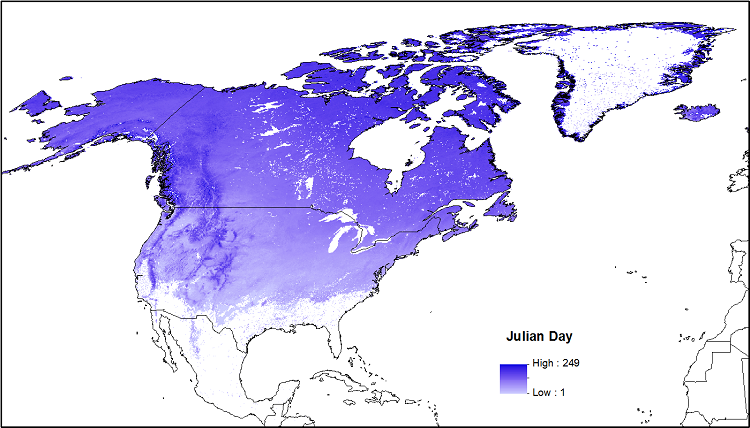 This data set provides snowmelt timing maps (STMs), cloud interference maps, and a map with the count of calculated snowmelt timing values for North America. The STMs are based on the Moderate Resolution Imaging Spectroradiometer (MODIS) standard 8-day composite snow-cover product MOD10A2 for the period 2001-01-01 to 2015-09-06. The STMs were created by conducting a time-series analysis of the MOD10A2 snow maps to identify the DOY of snowmelt on a per-pixel basis. Snowmelt timing (no-snow) was defined as a snow-free reading following two consecutive snow-present readings for a given 500-m pixel. The count of STM values is also reported, which represents the number of years on record in the STMs from 2001-2015. Also reported are the cloud interference values, representing the number of days of cloud cover between snow and snow-free scenes. O’Leary, D. III, D. Hall, M. Medler, R. Matthews, and A. Flower. 2017. Investigating the Early Snowmelt Event of 2015 in the Cascade Mountains By Developing And Validating MODIS-Based Snowmelt Timing Maps. In review. This project was supported through the National Park Service and National Science Foundation. Temporal Coverage: 2001-01-01 to 2015-09-06. For the yearly Geotiff files, the period is the first day of the year to September 9 of the same year. For example, 2002-01-01 to 2002-09-06. There are 33 data files with this data set in GeoTIFF (.tif) format. Note: The data are provided in the MODIS native 'Custom Sinusoidal' projection that is defined by the following “proj.4” string: +proj=sinu +lon_0=0 +x_0=0 +y_0=0 +a=6371007.181 +b=6371007.181 +units=m +no_defs”. These data may be of interest to researchers investigating questions of phenology, hydrology, climatology, land management, recreation, and other areas. The STMs were validated using in-situ observations and were compared with SNOTEL meteorological stations from across the western United States (NRCS, 2016). There was a high-level of agreement between the STMs and SNOTEL stations (n=854). There are numerous limitations involved in the application of our STMs. Of primary concern is the 8-day resolution of this product. While the MOD10A2 does improve upon the MOD10A1 daily product in terms of cloud-free data, it is still limited by some cloud cover, its 8-day resolution, and inherent snow reporting biases. This 8-day resolution differs from the daily or hourly resolution available using meteorological stations (SNOTEL). STMs were developed using a time-series analysis of the MOD10A2 Version 5 data product, which is a MODIS-derived 8-day composite snow-cover data product from the Terra satellite, developed by NASA and archived and distributed by the National Snow and Ice Data Center (Hall et al, 2006). The MOD10A2 8-day composite product represents the maximum snow cover, per pixel, from DOY 001 to DOY 361 by 8-day intervals, at a 500-m spatial resolution. This product is derived from a Normalized Difference Snow Index (NDSI) using a 50% Snow Covered Area (SCA) as the snow/no-snow classification threshold. Also defined are water, land, ice, or cloud for a given 8-day composite. The MOD10A2 data product begins Year 2000, DOY 057. Each snowmelt timing detection begins on DOY 001 and continues through the MOD10A2 image for DOY 249 (September 6) for years 2001-2015. These dates are configured for the Northern Hemisphere where DOY 001 will often already have snow present in seasonal snow zones, with snow melting through spring and into September. If snow is not present on DOY 001, subsequent snow events, defined by two consecutive MOD10A2 snow-covered pixels, are detected and their melt is recorded appropriately. Snowmelt timing was defined as a snow-free reading following two consecutive snow-present readings for a given pixel. The DOY reported for snowmelt is the first day in the 8-day composite image with no snow. All DOY values described are for the first day of the composite image. For instances where clouds interfere with this transition (e.g. a series of pixel readings such as snow, cloud, no-snow) the snowmelt DOY is given as the interpolated DOY between the first cloud reading (in the event of multiple cloud readings) and the first no-snow reading. Cloud interference values are the number of cloud-obscured scenes between snow and no-snow readings +1. For example, if the MOD10A2 image for DOY 105 is snow, DOY 113 and 121 are cloud, and DOY 129 is no-snow, the resulting snowmelt DOY would be 121 (interpolating from 113 to 129) and the resulting Cloud Interference value is 2 cloud-obscured images +1 = 3. Pixels with more than four consecutive cloud-obscured images (32 days) between snow and no snow were omitted due to lack of confidence in the interpolated DOY. Other data exclusions included late-season ephemeral snow events as they were not the main snowpack melt, and snow events with fewer than two consecutive positive snow readings (or one snow followed by one cloud) preceding the no-snow reading. Figure 2. 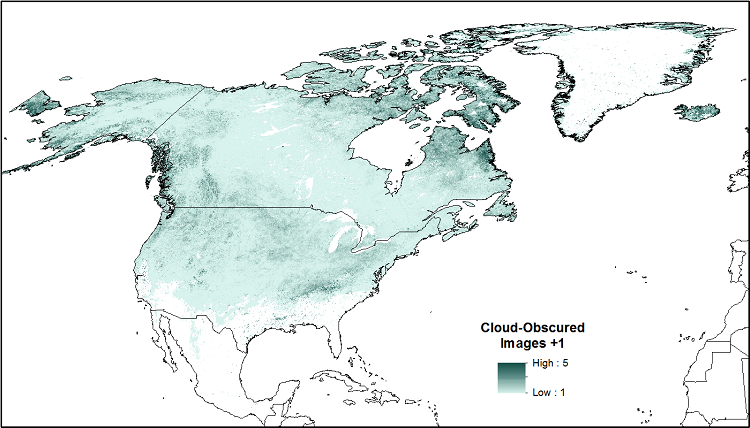 Mean cloud cover interference map showing values per pixel from 2001-2015. Note that mean cloud interference values disregard null values (years without STM values) and may therefore overestimate mean cloud interference for regions with low count values. White areas have no snow observations for the period of record. The Count of STM values - values representing the number of years on record in the STMs from 2001-2015 - were also calculated (i.e., snow was present at some point that year, and snowmelt timing was successfully calculated. Note that the projection of this image may not be in the same projection native to the data set). Figure 3. Count of STM values representing the number of years on record in the STMs from 2001-2015 (the projection of this image may not be in the same projection native to the data set). Snowmelt timing was calculated using custom python scripts controlling ArcMap 10.3. The SMT analysis was conducted in the data’s native custom Sinusoidal projection, creating the annual snowmelt timing maps. Hall, Dorothy K., George A. Riggs, and Vincent V. Salomonson. 2006, updated weekly. MODIS/Terra Snow Cover 8-day L3 Global 500m Grid V005, [2001-01-01 to 2015-09-06]. Boulder, Colorado USA: National Snow and Ice Data Center. Digital media. Natural Resources Conservation Service (NRCS) National Water and Climate Center. 2016. SNOTEL Data & Products. Available from: http://www.wcc.nrcs.usda.gov/snow/ (Accessed 3 September 2016).